The risk models used by businesses to help determine creditworthiness in the United States are under increased scrutiny by federal regulators, as they seek to foster more inclusive financial services for all U.S. consumers. Equifax Model Risk Management can help to better align your models with these changing regulatory guidelines. Model Risk Management is a value-added internal Equifax process that can help our clients by providing comprehensive model documentation, independent model validation and regular performance monitoring reports. 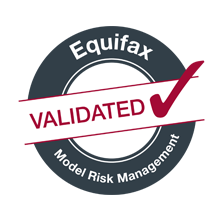 When you work with Equifax, you can be confident that the model has been independently reviewed and validated by the Model Risk Management group. To contact the Model Risk Management Group directly, please email productmodelriskmanagement@equifax.com.